Big news for eastern quolls! In 2018 these little predators will be making a comeback to mainland Australia with a little help from WWF. Eastern quolls were once part of our landscape for millions of years. They've been extinct on mainland Australia for over 50 years and can now only be found in Tasmania. In March this year, we’ll be helping to relocate them from Tasmania, all the way to Jervis Bay. Stay tuned for updates! Eastern quolls born in the wild at Booderee National Park have been photographed roaming independently from their mothers for the first time. WWF-Australia is working to breed the fiercely cute eastern quoll and bring them back to mainland Australia. The size of a small domestic cat, it’s no wonder the eastern quoll is a favourite marsupial of those lucky enough to see one. Nocturnal by nature, this solitary but bold carnivore usually hunts in open country or woodland. It can occasionally be spotted foraging by day but prefers to spend daylight hours in nests made under rocks in underground burrows or fallen logs. The eastern quoll has a pointed nose, a bushy tail, is covered in white spots. Eastern quolls have two colour morphs of either a soft fawn or dark colour, so while they may look slightly different, they are exactly the same species. It’s thought that these colour variations are an evolutionary adaptation to increase their chances of survival in the wild. A female can give birth to a litter of up to six quoll pups a year, and each litter will have a random variation of the dark and light colours. The eastern quoll was once found across much of the southeast mainland of Australia, from the eastern coasts of South Australia, through most of Victoria, to the north coast of New South Wales. They became extinct on the mainland around 50 years ago but remain relatively widespread in Tasmania. NEWS UPDATE: We have babies! Eastern quoll pups have been born on the Australian mainland for the first time in over 50 years. The baby quolls have been confirmed in three females that were released at Booderee National Park earlier this year. WWF-Australia is working in partnership with Rewilding Australia, Devils at Cradle Wildlife Park, Trowunna Wildlife Park, Parks Australia, the Australian National University and the Wreck Bay Aboriginal Community Council to breed and rewild these mini marsupials. The breeding program will create a viable insurance population to ensure the survival of the species for generations to come. Together with our partners, we are working to establish the first wild, eastern quoll population on the mainland since their localised extinction 50 years ago. 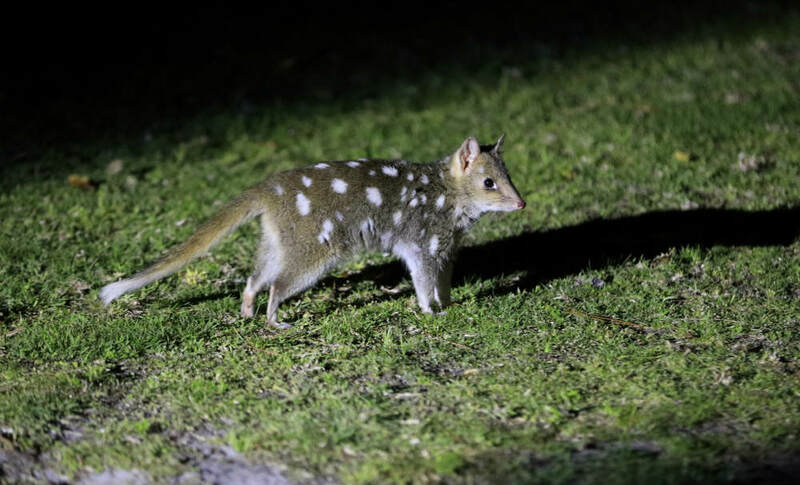 Over the next three years, groups of male and female eastern quolls will be reintroduced to Booderee National Park in Jervis Bay. 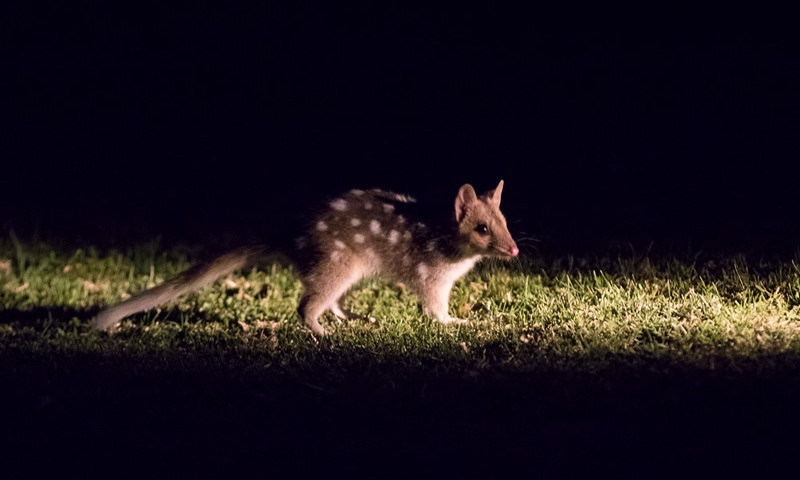 The national park has had long term management of introduced predators such as foxes and cats to help give the pioneering quolls a fighting chance to establish a thriving population where their ancestors once called home. Parks Australia and ecologists from the Australian National University will also be tracking them to ensure their well-being in their new habitat. Eastern quolls were once part of the Australian landscape for millions of years. Their mainland extinction is a sad and serious issue because, as a predator, they perform a valuable role. While the main component of their diet is invertebrates such as spiders, cockroaches and grasshoppers, these small mammals are also impressive hunters. Their appetite for rabbits, mice and rats helps keep the populations of these pests under control and maintains a natural balance in the ecosystem. Male eastern quolls are about the size of a small domestic cat, averaging 60 cm in length and 1.3 kg in weight; females are slightly smaller. Endangered - IUCN Red List. Eastern quolls once occurred on mainland Australia, with the last sighting occurring in the Sydney suburb of Vaucluse in the early 1960s. The eastern quoll is still relatively widespread in Tasmania but spotlighting data demonstrates that its population size has declined by an estimated >50% over the past 10 years. An eastern quoll is capable of taking prey nearly as large as itself. The exact reason for their mainland extinction is still unclear, however it’s thought that a combination of feral cats, red foxes, dogs, roadkill, poisoning, trapping plus a widespread epidemic all contributed to the localised extinction of these marsupials. While the eastern quoll is still reasonably widespread in Tasmania its current main threat remains the cat, and fox on mainland Australia. • Sign up to our newsletter and stay up-to-date on the latest quoll news from our teams in-the-field. 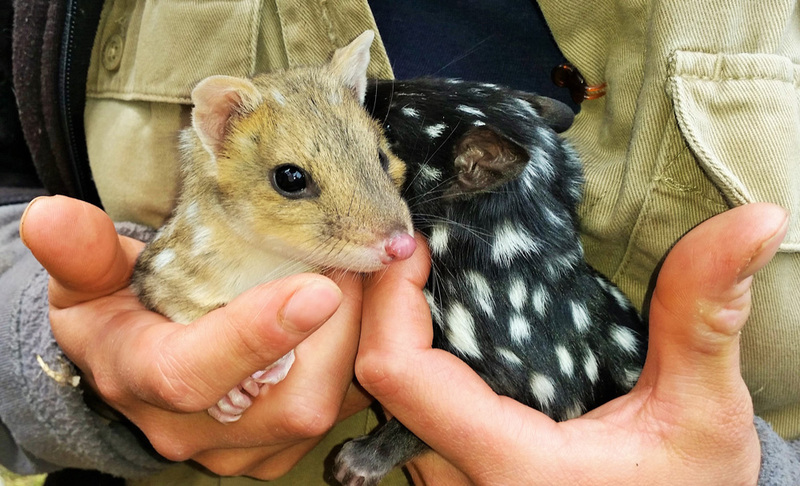 • You can donate to WWF to help us protect endangered species like eastern quolls. Spotted! Eastern quoll babies have been born in the wild on mainland Australia. Check out these exclusive photos. 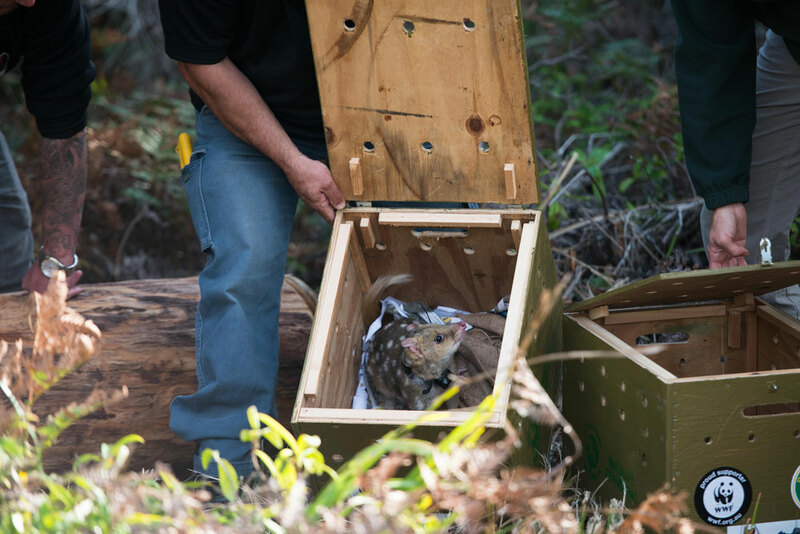 Translocating the eastern quoll to their new home in Jervis Bay was a pretty emotional time.